The Brown Insurance Group of Highland, IN is an independent insurance agency that delivers a recognizable difference to our clients through innovative and cost effective insurance, risk management, human resources and employee benefit solutions. What sets the Brown Insurance Group apart is our passion, dedication, and consistency. The Brown Insurance Group is comprised of knowledgeable and talented individuals demonstrating the highest standards of excellence and a passion for delivering unparalleled service. A commitment to thoughtful listening, understanding, and strategy enables our team to partner closely with clients in order to recognize the factors having the greatest impact on their well being. These insights, supported by valued industry resources, enable us to achieve optimum solutions for our clients and the assurance of their unimpaired growth. Remaining committed to conducting business in Northwest Indiana that is consistent with our values of trust, integrity, and accountability, we always strive to go beyond the expected. We proudly serve the Northwest Indiana region including Highland, Munster, Griffith, Schererville, Dyer, St. John, and Crown Point as well as the Chicagoland area. Founded in 1946, Koester & Brown Insurance Inc. prospered through application of traditional values, professionalism, honesty and caring service to its clients and community. By growing and adapting to the ever-changing environment, Koester & Brown Insurance itself evolved into an increasingly sophisticated provider of insurance solutions, taking the name of Brown Insurance Group in 2008 as a reflection of this progress. Of greater significance, to ensure that we continue to serve as a foundation for our client’s profitable growth, the Brown Insurance Group has partnered with Keystone Insurers Group, one of the largest and most progressive agency forces in the country. As a member of this distinctive organization, the Brown Insurance Group has obtained the ability to leverage the vast resources and intellectual capital of a national organization while maintaining our independence and commitment to our clients and community. Grounded in a passion for understanding our clients’ unique needs, the Brown Insurance Group endeavors to create cost saving opportunities and asset protection for clients large and small alike. At times, our greatest enjoyment comes from providing superior protection and unparalleled client service to our personal lines clientele, and we remain committed to doing so at the lowest possible cost. Similarly, by becoming a seamless extension of our commercial client organizations, we are able to share in their success through a sense of accomplishment as they realize the benefits of a properly structured insurance and risk management program. But most importantly, we believe the key to the success of the Brown Insurance Group lies in the enthusiasm and dedication shared by all personnel. Our exceptional team, combined with valued industry relationships allow the Brown Insurance Group to do what we do best… going beyond the expected. 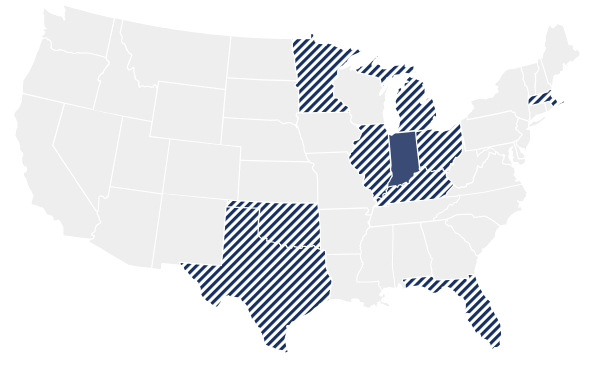 We are located in Highland, Indiana, and are also licensed in Illinois, Ohio, Michigan, Minnesota, Florida, Massachusetts, Oklahoma, Texas, and Kentucky.